This week I finally wade deep into the waters of a Marvel character I know very little about. I have heard really good things about this particular run however. Matt Fraction and Ed Brubaker team-up with a long list of artists to bring back a very under utilized character. Art By David Aja, Tonci Zonjic, Travel Foreman, Howard Chaykin, Mike Allred, and Nick Dragotta. As I mentioned before, other than a couple of reprint issues of Heroes For Hire from the 70’s, I have very little experience with the character of Iron Fist. But being a really big fan of what both Ed Brubaker and Matt Fraction have done for struggling characters. And having been told on many occasions that this run was a must read I decided to pick up the first volume of the complete collection that Marvel released in 2013. Danny Rand is the Immortal Iron Fist, the protector of the ancient city of K’un Lun. But what does that really mean for Danny Rand? That is the focus of this series. Even Danny doesn’t doesn’t fully understand who and what being Iron Fist truly means in the grand scheme. That is until he meets Orson Randall, the previous Iron Fist who actually has a tie to Wendell Rand, Danny’s Father. Orson has been the Iron Fist for decades, but abandoned his role after fighting too many battles in the name of both Earth and K’un Lun. The final straw being his obligation to fight in a tournament against the champions of the other six heavenly cities, known as The Immortal Weapons. 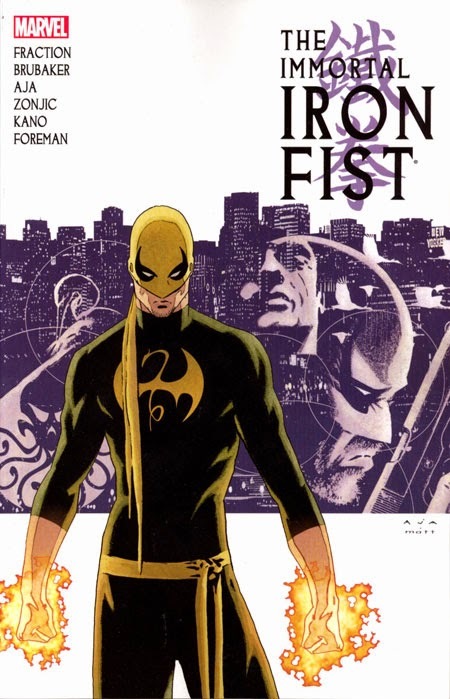 Orson comes out of hiding to teach Danny what the legacy of the Iron Fist really is through a book with the stories of every Iron Fist before him. It is through this book that the story really develops. Often starting an issue with a tale of one of the many Iron Fists of the past. The book also helps danny to learn new techniques that the power of the Iron Fist allows him to do. Such as the ability to quickly heal himself through a type of meditation. Before long Rand is neck deep in a war that has been brewing since the early days of Orson Randall’s turn as the Iron Fist. A war that forces Danny to return to K’un Lun to fight in the ancient tournament. But it also puts all of his friends at risk. Including the man that fronts Rand Industries day to day for Danny. Once Danny returns to the ancient city he finds that there are events set in motion that will change all of the seven cities of heaven. Events that lead Danny to the truth of what happened between Orson and his father. As well as why his father never took the mantle of Iron Fist. All of this is only the beginning of everything that takes place in this series. There are even some great cameos by Misty Knight and Luke Cage. Each of the writers brings something to the mix. Matt Fraction brings in the humor that he has become known for with Hawkeye. And Ed Brubaker brings his knack for noir and intrigue. But at the same time the two work really well together. Never did it feel that the writers were competing to express their visions of where the story should go. As for art. Aja carries a majority of the weight. But all of the artists get a chance to shine. Aja gets all of the main story pages, and he carries it well. Aja brings in some great panel layouts and concepts to show the passage of time. There were a couple of concepts for layouts that he uses again in Hawkeye. Most of the other artists are used for the stories of the other Iron Fists. Except for Howard Chaykin, who was the only artist on the Iron Fist Annual. A true credit to the artists is that with all of the art changes it never really suffers. Each artist brings their own flavor to their part and it all adds up to a beautiful bigger picture. I highly suggest this book to anyone who hasn’t already read it. It mixes the best of kung fu flicks and spy movies, with a very unique sense of humor. Thanks for reading my review. If you have any comments on the review or suggestions of other books to read, please leave them in the comments section. And as always. Keep reading comics fans.